OAKLAND, Calif. (AP) — By now, most everyone in baseball realizes the Oakland Athletics are rarely out of it. Almost no deficit is too daunting for a rallying cry, which could be led by any number of sluggers in a loaded lineup. Never before in his managerial career has Bob Melvin been around a club with such a knack for comebacks, for winning the close ones in the late innings despite what might seem insurmountable odds. Lately, other teams in contention have added to their rosters to try to do the same down the stretch of the season. During a recent trip in Texas, the A’s rallied from behind 10-2 to beat the Rangers 13-10 by scoring 11 runs over the final four innings and getting a three-run homer by Khris Davis in the 10th. They have earned a reputation around baseball — in both leagues, on both coasts and in between — for their ability to keep swinging for the fences and pitch when trailing at any stage of a game. Oakland is right on the heels of reigning World Series champion Houston in the AL West, the A’s trailing the Astros by five games going into their day off Thursday. The small-budget franchise hasn’t reached the playoffs since losing the AL wild card game in 2014, finishing last in the division the past three seasons. The A’s didn’t get their 60th win until Sept. 8 last year and already reached that mark by July 25 in 2018. They were 27-7 since June 16 before being swept in a three-game weekend series at Colorado from July 27-29, then swept the Blue Jays and Tigers in back-to-back series. New Oakland reliever Shawn Kelley was playing in Washington and went to bed before the A’s were done most days but still had heard plenty about the penchant for finding a way to win late. Melvin has a deep and talented bullpen that allows him flexibility to mix and match at any point in a game — and the A’s acquired closer Fernando Rodney from the Minnesota Twins on Thursday to bolster that strong unit. “I don’t know if I’ve had this many quality arms in a bullpen ever since I’ve been managing,” he said. The Milwaukee Brewers know how important winning the close ones will be over the season’s final two months. They acquired veteran reliever Joakim Soria and left-handed power hitter Mike Moustakas in a pair of big trades over two days ahead of the deadline. “That’s two different types of things saying when you’re not out of it and winning close games,” manager Craig Counsell said. “I think we had a team last year that we felt like we played in a ton of close games, so you do get kind of hardened to it a little bit as far as it’s the game you play every night. What we felt more than anything is how do you bounce back, because you are going to lose some of those games and how do you kind of respond when you lose games like that? Oakland’s late-inning numbers are phenomenal. The A’s have 31 comeback wins and are the only team in baseball not to lose when leading after seven innings — 46-0 — and have a 61-game winning streak in such contests. Oakland is 55-0 when leading after eight innings, while Seattle (57-0) is the only other team not to lose when ahead after eight. The A’s are best in the majors scoring runs in the seventh inning or after with 217 and the eighth inning at 87. They also lead the majors with 10 comeback wins trailing after seven innings. At 22-9 in one-run games, that is also the best record in the majors. Some managers believe it can become contagious. 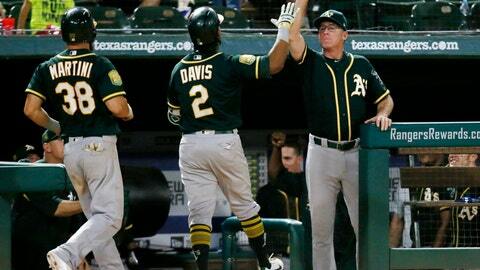 The A’s have a noticeable swagger having won so many games in dramatic fashion. “It just gives you that extra confidence when you get behind, you don’t worry about it,” Detroit manager Ron Gardenhire said. It’s pretty simple in Melvin’s mind: Stick with it, play every out. Though he knows that means making the right moves with the pressure on to pull off some late-game magic.